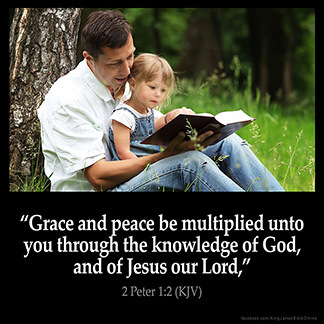 2 PETER 1:2 KJV "Grace and peace be multiplied unto you through the knowledge of God, and of Jesus our Lord,"
Grace and peace be multiplied to you in [the] knowledge of God and of Jesus our Lord. grace and pees be fillid to you, bi the knowing of oure Lord Jhesu Crist. 1:2 Through the divine, experimental knowledge of God and of Christ. 2Pe 1:2 Grace and peace. The usual apostolic benediction. These come through the knowledge of God, and of Jesus Christ our Lord. Those who have learned to know God and his Son have eternal life (Joh 17:3). This knowledge is one that comes from fellowship with Christ. does grace multiply in our lives according to 2peter 1:2 or we grow in the specific grace which is given to each differently according to God's purpose for each one of us for the edification of the whole body of Christ.OR can someone who has been called to being a prophet after increasing in knowledge gets more grace to become a teacher of the word or an apostle? Romans 12 Paul says ''according to the grace given to us(Romans 12:6). 2Peter 3:18 says we are the ones to grow in the grace and not grace to grow in us. Ephesians 4 tells us about some being apostles others prophets etc,the final question is can some one grow in knowledge and ends up being gifted with all gifts after the multiplication of the grace? I will be happy to receiving a reply from you via my email. God bless you and your ministry.